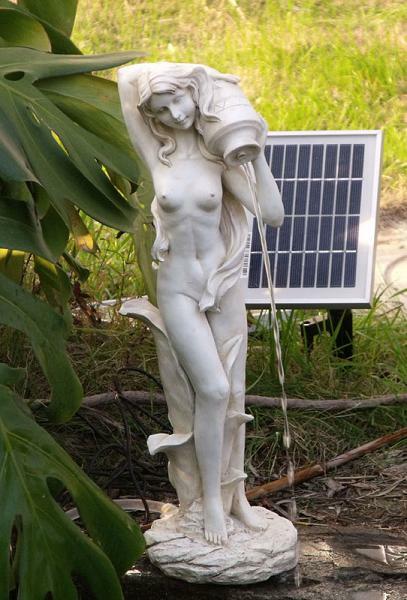 This White color goddess aphrodite (Venus) holding a pot that spits water as if it where a water fountain. With the definition and the intricate details of this piece, it is simply breathtaking. The hand-painted color accents and antique finishes further add to the depth and richness of the artwork and the water feature it produces adds more tranquility to your pond or other water feature. The special production process of this piece originated from Greeks; it uses bronze powder mixed in the cold resin in order to ensure a richer life-like presentation.This 2 watt sun powered submersible water pump statue combo is a daytime running system only.